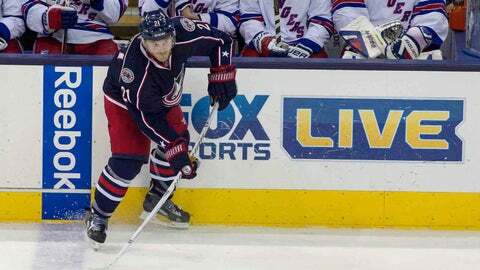 Columbus, OH, USA; Columbus Blue Jackets defenseman James Wisniewski (21) looks to pass the puck in the third period of the game against the New York Rangers at Nationwide Arena. A new day dawns for Columbus as they try to get the stench of Thursday night’s 5-4 loss to Philadelphia out of their nostrils. With the Flyers in town, the Blue Jackets took part in a spirited, if somewhat sloppy, morning skate. Head coach Todd Richards addressed if his team is ready for the rematch. "It’s tough to get a feel based off of our morning skate," he said. "We didn’t seem to have energy and we were a bit sloppy. But going into the Philly game (Thursday), our morning skate there was good. So, it’s tough to get a feel of the group, of where we’re at." While "embarrassing" was a term heard often two nights ago, a steely resolve seems to have taken its place ahead of tonight’s tilt. "(The loss) should be fresh on their minds," said Richards. "It just happened two days ago. So, I’m expecting a push from our team tonight." Notwithstanding the recent loss, Columbus needs to keep their emotions in check, channel their anger and play their game. "We understand that this is a huge two points for us," said F Nick Foligno, "and we let two points slip away on Thursday. In order to be a good team, you have to make amends for that. The emotions are going to be high, obviously. Ultimately, what we need is the win and we have to do whatever it takes to get that." Both F Marian Gaborik and D James Wisniewski will be back in the lineup tonight. Gaborik has played in 17 of the 35 games, accruing 5-6-11, +1. His offensive skill will be a welcome addition as they take the ice. Gaborik brings "some speed and a threat to score and make plays," said Richards. "That’s what he provided us last year, but he’s going to have to come in and work, skate and play fast." Wisniewski brings "power play, some poise on the backend, a right-hand shot and solidifying the (defensive) pairs again," Richards said. "It’s a veteran guy on the backend who has some moxie when he gets the puck on his stick. He’s got to keep it simple early, because it’s going to be a fast game. At least I’m expecting it to be a fast game." Shutting down the Flyers captain, Claude Giroux, is a key to the game. "I want somebody against Giroux that can nullify Giroux," said Richards. Richards had no update on F Jack Skille, injured in Thursday night’s game. Derek MacKenzie skated today and could return as early as Monday for the away game at the Carolina Hurricanes but might not be ready until a Dec. 27 game against the New Jersey Devils. With 143 man games lost to injury, the healthy players have to step up and play their game. The debut of Nathan Horton is inching closer to being imminent. With the next four games being against divisional opponents, these are huge "four point" games for Columbus. With a win tonight, they can get within two points of third place in the Metro Division.